My friend Frank came to see me the other day and told me he felt “uncomfortable.” I pressed for more information, but he was hesitant to admit what was wrong. “Are you sick?” I asked. “Are you not getting enough sleep?” He finally admitted that he hadn’t had a bowel movement in over a week. “I’m constipated,” he said gravely, as he stared dejectedly at the floor. I wasn’t exactly sure why Frank seemed embarrassed about this issue. In the U.S., frequent constipation affects over four million Americans. In fact, over 90% of clients who see holistic practitioners complain of constipation. Constipation is a pressing digestive issue that affects your bowel movement. How often you have a bowel movement is subjective; however, fewer than two to three weekly bowel movements is a conventional description of constipation. At least one bowel movement daily is considered normal; however, two or three would be better. The most common cause of constipation is a low-fiber diet. Other causes include inadequate fluid, lack of physical activity, ignoring the urge to have a bowel movement, or taking medications such as diuretics, anticonvulsants, antidepressants, antispasmodics, iron supplements, blood pressure medications, antacids, anti-Parkinson’s disease drugs, or pain medications like narcotics. It can also be a symptom of a specific condition or disease, such as diabetes, kidney disease, multiple sclerosis, stroke, hyperthyroidism, pituitary disorders, diverticulosis, irritable bowel syndrome (IBS), an imbalance of gut bacteria (dysbiosis), or colon cancer. The problem is too many people rely on laxatives to move their bowels. Americans spend over $725 million on laxatives every year! It’s no wonder that laxative abuse is also a common cause of constipation. Senna and cascara sagrada are known as natural herbal laxatives; however, they are only recommended for short-term use, and they can still irritate the colon. 1. 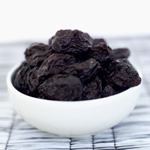 Prunes: Prunes are perhaps the most common food to eat when constipated. They have a natural laxative effect and they help make the stool softer. In a 2011 study published in Alimentary Pharmacology and Therapeutics, researchers discovered that prunes are more effective than psyllium husk in treating mild to moderate constipation. The study observed 40 people with constipation over an eight-week period. 2. Ground flaxseed: Flaxseeds have a high concentrated source of fiber. A study published in 2011 found that women received constipation relief when ground flaxseed was added to their diets. It is best to grind flaxseeds in a coffee grinder for optimal freshness. One to two tablespoons daily of ground flaxseed is a great addition to smoothies for those prone to constipation. Ground flaxseed also helps increase the frequency of bowel movements. 3. Chia seeds: Chia seeds are also high in fiber, and they can help reduce constipation symptoms; however, it all depends on how you consume chia seeds. It is best to pre-soak chia seeds for about 15 minutes. For best results, combine one to two tablespoons of chia seeds with an eight to 12 oz. glass of water daily. 4. Kefir: Moderate amounts of fermented foods are known to help balance the intestinal flora. Good choices include sauerkraut, kimchi, kombucha, miso, and kefir. Kefir in particular is known as an effective natural remedy for constipation. Kefir also contains tryptophan, which promotes good digestion. 5. Dark leafy green vegetables: Dark leafy green vegetables are excellent sources of fiber and magnesium that both promote constipation relief. People with low magnesium have a higher chance of getting constipated; magnesium is known to improve gut motility and help retain water in the colon. Some good dark leafy green choices include spinach, Swiss chard, collard greens, and kale. Overall, it is best to consume a whole foods diet that contains nuts, seeds, vegetables, fruits, beans, and whole grains. Other foods that help relieve constipation include blueberries, kiwi fruit, hemp seeds, and almonds. • Dairy products: It is best to avoid dairy when feeling constipated. Milk, cheese, and other dairy products are foods that have a long history of causing constipation. Dairy products are considered mucus-forming foods that can slow the transit time of waste during the digestive process. The lactose in dairy is thought to produce the uncomfortable symptoms associated with constipation. • Red meat: Red meat is heavy in fat and does not contain fiber. Foods high in saturated fats move through the intestines slowly and impair digestion. Red meat contains large amounts of the red-colored pigment called myoglobin, which is high in iron. Excessive iron in the diet may harden the stools and lead to constipation. • Gluten-containing foods: Processed foods have very little fiber, and many of them also contain gluten such as cookies, breads, pastas, and baked goods. Gluten sensitivity is often at the core of many digestive disorders, such as IBS or diverticulosis, where constipation is a common symptom. • Stimulants: Alcohol, caffeine, and sugar are stimulants that lead to constipation. Alcohol and caffeine are hard on digestion and can also lead to dehydration. Constipation can result when stools are hard and dry from dehydration. The low fiber in many sugary products can also produce constipation. Alcohol will also cause an electrolyte-loss (i.e. a loss of potassium and sodium)—electrolytes help provide moisture to stools. • Chocolate: Dark chocolate, cacao chocolate, and milk chocolate all contain caffeine and certain chemicals that may trigger digestive problems like IBS and constipation. Milk chocolate also contains milk, and that can cause constipation for certain individuals who are sensitive to dairy products. • Fried and processed foods: Everything processed and fried should always be avoided (i.e. potato chips, frozen dinners, and French fries). These low-fiber and high-fat foods also contribute to constipation and digestive problems. • Unripe bananas: Ripe bananas contain fiber and can help relieve constipation; however, unripe, green bananas contain high amounts of starch that can be tough to digest. Figure out the cause of your constipation and make necessary changes. For example, stop over-using laxatives, or discover which medication is causing your constipation. Never hold in a bowel movement. Drink up to eight glasses of pure, filtered water daily. Set a specific time to defecate every day, such as after breakfast or after exercising. Maintain a regular exercise routine of 20 minutes a day, three times weekly. Murray, M., et al., The Encyclopedia of Natural Medicine: Third Edition (New York: First Atria Paperback, 2012), 451-455. Balch, J., et al., Prescription for Natural Cures: A Self-Care Guide for Treating Health Problems with Natural Remedies Including Diet, Nutrition, Supplements, and Other Holistic Methods (Hoboken: John Wiley & Sons, Inc., 2004), 175-180. Lawless, J., The Encyclopedia of Essential Oils: The Complete Guide to the Use of Aromatic Oils in Aromatherapy, Herbalism, Health & Well-Being (San Francisco: HarperCollins Publishers Ltd., 2002), 202. “Why red meat causes constipation and how to handle it,” HappyBowel web site, May 10, 2015; http://www.happybowel.com/red-meat-causes-constipation/. Attaluri, A., et al., “Randomised clinical trial: dried plums (prunes) vs. psyllium for constipation,” Alimentary Pharmacology Therapy 2011; 33(7): 822-828. Lee, E.J., “A qualitative study of quality of life and the experience of complementary and alternative medicine in Korean women with constipation,” Gastroenterology Nursing 2011; 34(2): 118-127.